Seattle is, in many ways, Denver’s most comparable peer city. Like the Mile High City, Seattle was built to move cars, but as it grows, the city is looking to retrofit its streets to move people via transit, biking, and walking. There’s a stark difference between the two cities’ approach, though. Seattle is backing up its talk with swift action made possible by gutsy leadership, while Denver’s progress has been hindered by bureaucratic timidity. Today Next City published an excellent feature on Dongho Chang, Seattle’s top traffic engineer, and how he’s whetted the city’s appetite for complete streets. Chang has a penchant for implementing demonstration projects to cut through red tape, and so far the strategy has yielded protected bike lanes and road diets on a scale that Denver has only dreamed of. That willingness to make people angry and not bow to the loudest dissenting voices is rare among bureaucrats trained to run from controversy and seek the path of least resistance with new projects… Whether it’s a product of Chang’s character or indicative of the growing institutional and political support for these sorts of projects, it’s helping to slowly change transportation in Seattle. Chang’s leadership spawned Seattle’s most prominent bike lane, a two-way lane protected by curbs, planters, and plastic posts on 2nd Avenue. Seattle’s DOT announced and implemented it within five months, Cohen reports. Denver’s premiere bike facility, a one-way bollard-protected lane on 15th Street, took four years from inception to completion. 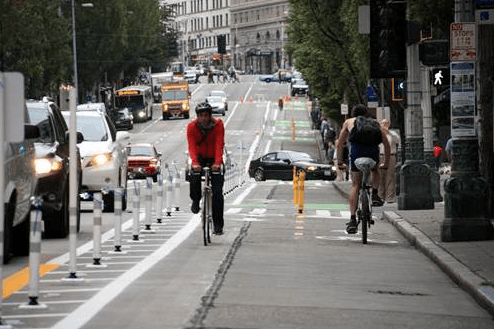 Seattle has eight protected bike lanes. Most of them are two-way and have stronger vertical barriers than Denver’s two protected lanes, which have a combined length of less than one mile. It’s odd to talk about the celebrity of a city bureaucrat, but it’s real. Some of it stems from his deep enthusiasm for biking and walking infrastructure. Given 15 minutes, he will inevitably talk about building communities that don’t rely on cars. It makes advocates feel like they’ve got an ally in the agency. This people-oriented mentality plays out on Seattle’s streets in several ways, but the city’s adoption of Vision Zero is a major one. Meanwhile Mayor Michael Hancock’s administration is still debating whether to proclaim that traffic deaths are unacceptable. It’s not a perfect metaphor, but as populations continue to grow, budgets continue to flounder and climate issues compound, DOTs will need to make the same realization that building out endless road capacity is at best a Band-Aid and at worst a propping up of a societal ill.
Widening I-70. Widening roads at I-25 and Broadway. Widening Quebec Street. These are all obsolete ideas that in all likelihood will nevertheless be built, simply because they’ve been on the books for so long. The Department of Public Works and the Colorado Department of Transportation know better, but officials have invested too much time and money, it seems, to rethink these projects. If you read the Next City piece as a Denver resident, you’ll see that the similarities between our transportation woes and Seattle’s are striking. But even more striking are the differences in how we try to solve them.